» Character Curriculum For Every Home! NOTE: This Launch Deal is sadly over. It was awesome and we’re super sorry if you missed it. However, the curriculum is TOTALLY WORTH EVERY PENNY of it’s regular price. We believe in this curriculum from top to bottom and hope you’ll give it a chance even though it’s a little more expensive now. It really is life-changing for every member of the family. You know how much I adore creating cute printables for you, right? Sometimes, though, I come across another designer who has fantastic ideas that are so well executed, I just have to share about them with you! This character curriculum is just so beautiful and well thought-out, and I don’t want you to miss the special launch pricing! There isn’t much we will teach our children that is near as important to their life as character. Much of this is taught by example. We show them how to exhibit excellent character traits by living that way the best we can. It’s just as important, however, to be intentional about this and as your children grow and learn, talking about specific character traits and working on building lifetime habits around them can make a lasting difference in their life. Character Curriculum Covers 30 Traits In Depth! My Character Matters takes you through 30 traits and asks you and your children to really think about them. Together you will define each trait, learn how the Bible defines it, discuss it, find examples of it, see where that trait is lacking and the ill effects caused, and so much more. Through the study of each trait, you and your children are invited to really look at your own experiences and apply these traits to your everyday life, leading you both to a fuller life! Sound like a lot to ask of a PDF file? How Much Does This Character Curriculum Cost? Please don’t wait. Give this character curriculum a try today and let me know what you think! To use this with your children, if you do not want to study character from the Bible, you can easily just skip that part! 🙂 There is one question for each trait that asks how the Bible defines the trait. Also, in the parent guide, there are quotes from the Bible for each trait, which are easy enough to skip right over. The rest of the workbook and guide book are fantastic no matter your world view and I hope you give it a chance. There is so much to be learned and improved by using this curriculum and I am confident you’ll enjoy the discussions and stories that form out of the assignments. The My Character Matters Activity Pack will be released 8/15 and everyone who purchases the My Character Matters Student Workbook before that date will get their copy for free! 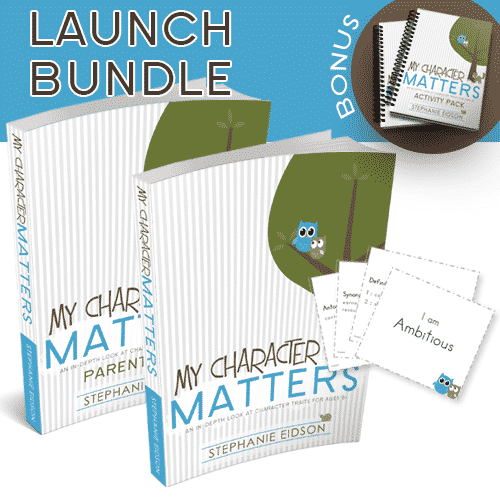 During the launch period you will receive both the My Character Matters Student Workbook and Parent Guide for the price of just the workbook! You also get the My Character Matters Flash Card set for free! How do YOU currently teach Character? New Chalk Board Calendar Numbers PLUS: IT’S HERE!!! I Just ‘Bought’ $50 in Free Clothes and You Can, Too! I have been looking for something like this for my girls! My oldest two are 6 and 5 and are the ones I want to start something like this with on a regular basis. I saw it said 8+ but would this be appropriate for them or what skills do they need to demonstrate before you would recommend this curriculum?